On that note, a couple noteworthy regional sweets were featured in the new issue of “Food Network” magazine. (2) Highlights a bunch of off-the-beaten-path cupcake flavors around the country. I’m particularly curious about this BLT one from cupcake “gallery” More in Chicago. They specialize in salty-sweet combinations (fig blue cheese cupcake, anyone? ), and by all accounts they do it well. This jalapeno-topped cupcake from Over the Rainbow Cupcakes in Scottsdale, AZ, makes me smile, though I’m not sure I want to eat it. Why is Georgetown Cupcake so successful? Let’s take a closer look. Pie and I were talking yesterday, as we munched down on cupcakes from Red Velvet. Why is it that, even though some of their cupcakes (and those at other cupcakeries) could go toe-to-toe with Georgetown Cupcake’s, they don’t get nearly the same amount of publicity or business? Here are some of our observations, for what they’re worth. The sisters who own Georgetown Cupcake both have business backgrounds, which translates to a lot of marketing savvy. Look at their packaging, for instance. You see someone walking down the street with that bright pink box, and you know exactly what’s in there. A visual shortcut that tells you there’s something covetable inside, evoking a Pavlovian response in sugar fiends like me. Kind of like what Tiffany’s blue box does for women in general. Ok, not quite. But you get my drift. To that point, the sisters are telegenic and PR-friendly. They’ve been on TV (their own reality show, Cupcake Sisters, is currently filming, though I’m wondering how they’re gonna bring the dramz), in newspapers, magazines, and more. They milk the PR machine, something the other DC cupcake places don’t do as well. They take full advantage of social media. Check out their FB/Twitter promo giving out free cupcakes. Plus they have fabulous names like Sophie LaMontange, which makes her sound like a French countess. Georgetown Cupcake's lime flavor is my favorite. See the flecks of lime zest in the icing and cake? But it always leaves me wanting more cake to balance the amount of icing out. Georgetown Cupcake was “first to market”–before they hit DC in early 2008, there were bakeries that sold cupcakes–Cakelove, Baked and Wired–but none that specialized in just cupcakes. (Readers, correct me if I’m wrong here.) In business, that’s important in establishing market dominance. Or something like that. Their cupcakes are moist, which is what the people want. There are different preferences out there–some like Cakelove for the old-school dryness because it reminds them of their grandmother’s homemade cakes. But overall, we’re a generation raised on Betty Crocker mix, which means moistness. Their cupcakes are less expensive than some of the other places. Hello, Red Velvet. A dozen there costs over $39 after tax (whoa). At Georgetown Cupcake, I paid $31.90 after tax last month. No, not cheap, but not unreasonable for boutique cupcakes. They won The Washington Post cupcake wars a while ago with their chocolate ganache cupcake. I don’t think it’s their best, but hey–chocolate’s a crowd-pleaser. When was the last time you heard an American say they hated chocolate? Their prime locations. When I’m in Georgetown Cupcake (or any cupcake place), 75%+ of the customers are women. And women go shopping in Georgetown and Bethesda, their two locations. Add to that the college kids from GWU/Georgetown, and you’ve got a captive audience. As more players enter the DC cupcake market (Sprinkles, Crumbs), it’ll be interesting to see whether Georgetown Cupcake can maintain its edge. But for now, they’re the queens of the DC cupcake scene. Sometimes I’ll swing by after work to see if they still have their avocado sandwich (avocado, pine nuts, parmesan, and arugula. So good.) They were sold out last time I was there, but I can’t seem to leave Pret empty-handed, so I grabbed this raspberry bar and carrot cake slice instead. How were they? 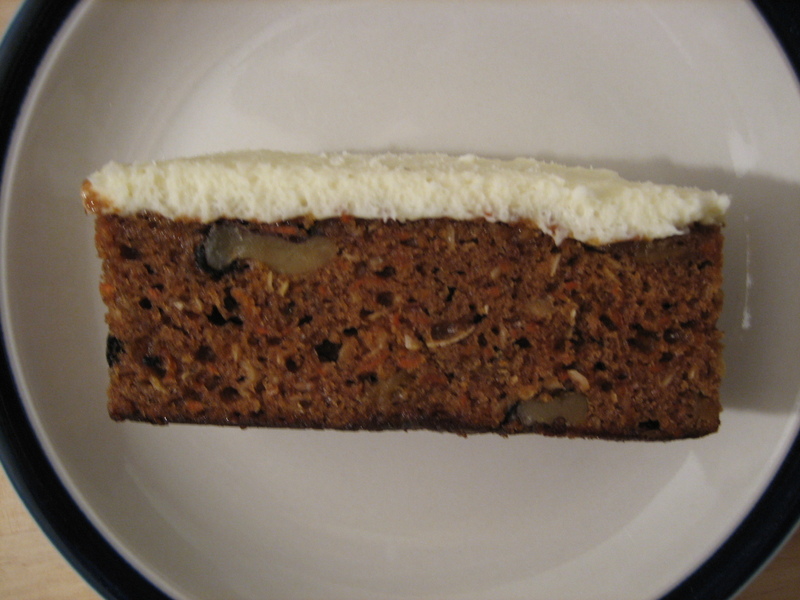 The carrot cake was moist, the cream cheese icing delicious (you could tell it was made with very fresh cream cheese.) But I like raisins in my carrot cake, which this one didn’t have. Still, I’d buy it again. On the other hand, I won’t be getting the raspberry bar again. 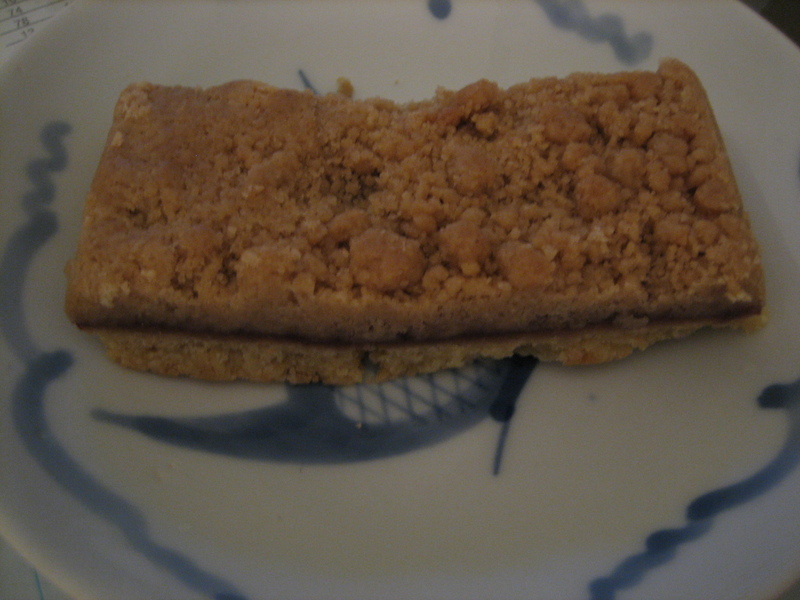 Yes, it was buttery, but I would have liked a chewier, more substantial raspberry center. I even considered not finishing it, which is unusual for me. I exercised unusual restraint yesterday by only getting one box of this new Trader Joe’s dessert, figuring that I should at least try it before making a bigger commitment. Well, I regretted just buying one box, because they were sold out when I went back this morning. 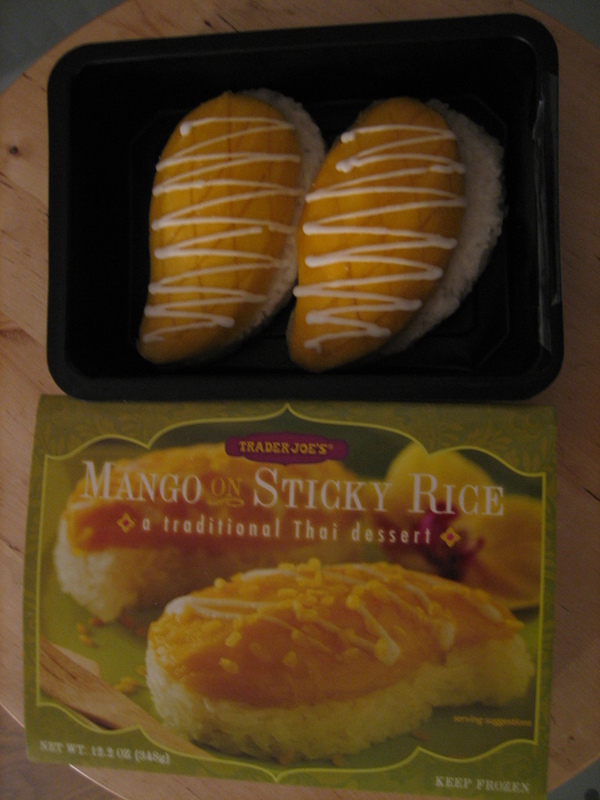 Apparently Mr. X-sXe and I weren’t the only ones who loved the Trader Joe’s version of this Thai dessert. We were both impressed with the balance of sweet coconut milk, fresh mango, salty-sweet sticky rice, and fried mung beans (packaged separately to stay crispy). At $3.29 for two servings, you’re paying less than what you’d pay at a restaurant for one serving. It’s made in Thailand, and actually better than what I’ve had at some Thai restaurants in DC (with the exception of Kanlaya’s version, which is unrivalled–they always get their sweet/tart mangoes perfectly buttery-ripe. It makes our Best of DC list: https://pievcake.wordpress.com/best-of-dc/). Also, it’s pretty cool when the actual product looks just as good in real life as the photo on the package! BTW, this is vegan-friendly. 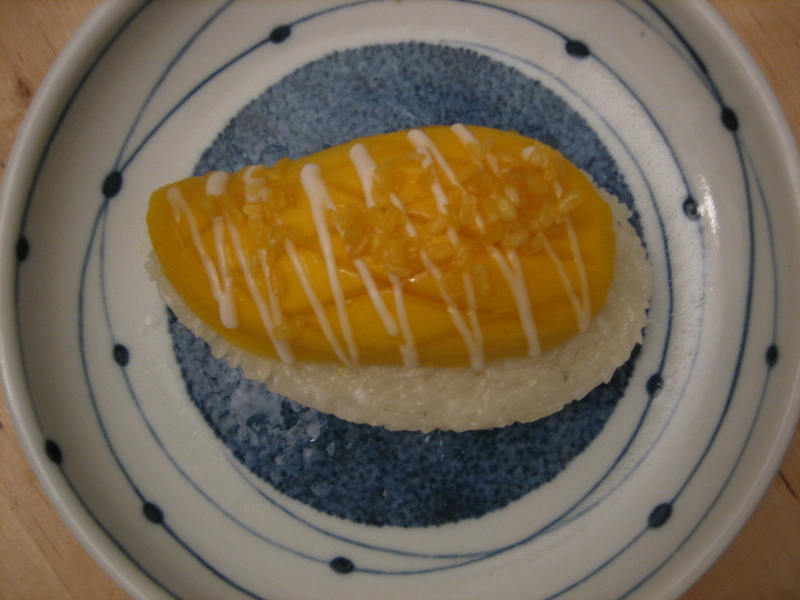 The ingredients are mango, sticky rice, water, coconut milk, mung beans, and palm oil. I’m all over this Living Social deal of the day. They’re offering a $50 gift card to Red Velvet’s E Street location for half price. While I don’t recommend the lime flavor (the icing reminds me of Crisco), the other flavors I’ve tried are pretty tasty. Plus it’s rare to get a cupcake in this town for less than $3! This is from Julia’s Empanadas. I was there for my usual turkey-spring onion empanada, and the cashier convinced me to get the meal deal, which includes dessert. The filling is half a canned pear in yummy almond paste. It reminds me of those fancy pear tarts you see sitting on doilies at patisseries for $5/slice. Love the string–makes it feel like a little package.